The first sunny days of spring are always a welcome sight here in the rainy Pacific Northwest. 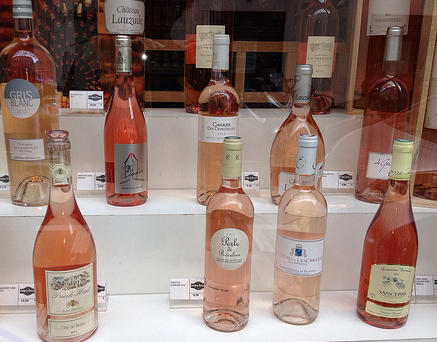 I like to celebrate the first slightly warm, sunny day with a glass of rosé. My first glass of the year was Underwood Rosé from The Union Wine Company in the Willamette Valley. The aroma was a pleasing mix of ripe bananas, melon, and a whiff of hay, and the flavor was (very) crisp with a slight tingle on the tongue. It’s a very refreshing wine for warm days but too tart to eat with a dressing soaked salad. I think grilled chicken would be perfect with it. (Doesn’t everyone plan dinner after they’ve selected the wine?) I was pleased to find an affordable Oregon rosé and will definitely buy it again. This pretty pale blush wine looks so sweet and innocent but it’s actually more complicated than that. The aroma is of citrus with cherries but the first sip is bracing and crisp with a nice acidity to it. There’s a slight minerality on the tongue, which I like. There’s nothing sweet about this rose but it’s perfect for a hot summer day. Or a cool summer day as is often the case this time of year in the Pacific Northwest. The grapes used are Grenache Noir (30%) and Syrah (70%).the bottle cost about $10 and I may buy a case. If you want a crisp rose, I highly recommend this. Any new favorites or old standbys you like for the summer? 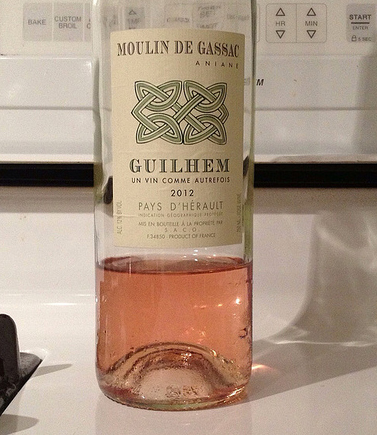 I was browsing the wine section at Pastaworks the other day and found this rosé from the Languedoc region in southern France and decided to give it a try. I’m so glad I did – it’s one of the best roses I’ve had this year. Taste: crisp, acidic with a bit of minerality. The finish was shortish to medium. I like this wine because it’s crisp and drinkable, and could be a refreshing apertif or sipped with a meal. I wouldn’t suggest drinking it with a vinegary salad because it’d would just make the salad and the wine too acidic. According to the winery’s website, the vineyard was founded by Charlemagne’s advisor, Saint Benedict of Aniane. It’s possible that he introduced Charlemagne to some of the Gassac valley’s early wines. Do you have any special drink or food you only have in the summer? I enjoy drinking rosé this time of year* — there’s something about warmer weather and pink wine that goes together so well. I found this local Oregon wine by Joe Dobbes at our local supermarket and decided to check it out. It’s been listed by Wine Business Monthly as the #1 Hottest Small Brand of 2011. I didn’t know this until after I tasted it, so it didn’t affect my judgment. This is a lovely pink wine. The scent was perfumed with the smell of roses and melon — very fragrant. The wine was bright and acidic, with a medium aftertaste in which tartness lingers on the tongue. It’s very refreshing and went really well with a sausage pasta dinner. I’ll definitely buy this wine again — crisp, acidic, and delicious for under $15. *When I first opened the bottle it was a wonderful warm day; as I write this post, it is NOT. This time of year should be above 65 degrees, in my opinion.